Texas Farm to Texas Feeder-Locally grown ingredients . 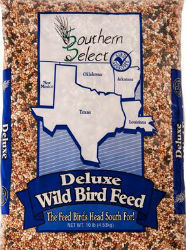 This bird seed is a blend of White Millet, Red Milo, Creme Milo, Black Oil Sunflower, and Safflower for all types of seed-eating birds. Options: 10 lb. 20 lb. 40 lb.